Yamaha's MusicCast might give you a sense of déjà vu. That's probably because we ﬁ rst wrote about it in 2003. Back then, when home networks were ﬂ akey and the music was still largely distributed on CD, multi-room remained the province of custom installers, despite Yamaha's best efforts. Now that we're deep into the smartphone era and broadband has become a basic human right, the ground is fertile for a MusicCast system that embraces all of the current formats and streaming protocols. We're seeing a spike in the number of AirPlay, Wi-Fi and Bluetooth streaming devices available, but few that can incorporate all three protocols. MusicCast does just this with every product, which means you can bring your existing Bluetooth speakers into the network, even if they're not made by Yamaha. As with every multi-room system, it's all about the app, and the MusicCast controller is a cracker. It's a free download and it comes with a rolling demo mode, so you can see an example of how your touchscreen is split into the rooms of your house. You can adjust, or change, the music in each room, or have them channel the same source by touching the link icon. Our favourite feature, however, is the way you can customise the interface by uploading your own photographs of each room. Just remember to tidy up ﬁrst. MusicCast is refreshingly format- agnostic, too, playing and sending every kind of sound ﬁ le, from FLAC to Dolby Atmos. And if the component on the receiving end can't read it, the ﬁ le is converted to a more manageable data package, so even the portable Bluetooth speaker in the garden could be belting out a Super Audio CD on your hi-ﬁ , albeit down-mixed. 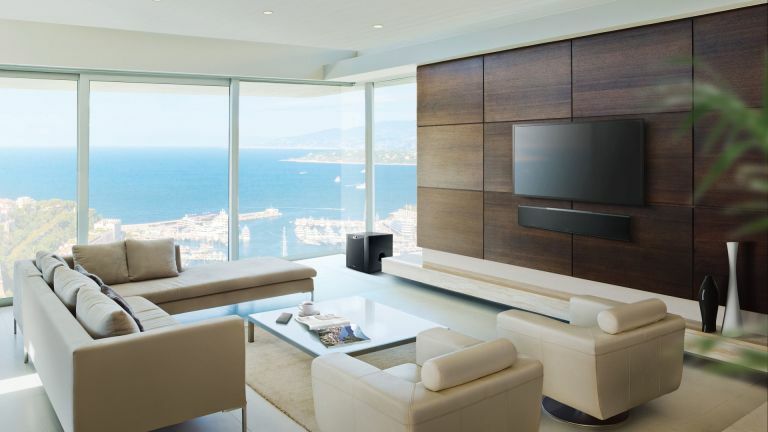 Every MusicCast component is high-res-capable – so that's 20 products so far, pulled from every strand of Yamaha's home- entertainment business, from soundbars and AV receivers, to micro systems and studio monitors. If the future of multi-room really is high-res, MusicCast is ready for it. At ﬁ rst glance, it's not the standout feature, but the fact that Yamaha's MusicCast employs Bluetooth both ways – in and out – in every one of its components is a revelation, because it means you're not locked into a single proprietary system. With MusicCast, any source that's connected to the product in question can be shared to an external Bluetooth speaker or a pair of Bluetooth headphones. And while Yamaha would love for the external Bluetooth device to be another MusicCast product, it doesn't actually have to be, and this is unusual. Taking the AV Receiver as an example, with MusicCast functionality added it becomes a distribution centre or network hub. This makes the connected home a reality. But there's more... Imagine watching sport on your smart TV, with the audio coming out of your soundbar, and you want to go outside without missing the commentary at a crucial moment. MusicCast will let you link any portable Bluetooth speaker so that you can take it outside with you. Brilliant. Liked this? Why not read Did Chromecast Audio just render network music players pretty much redundant?